Did You See? 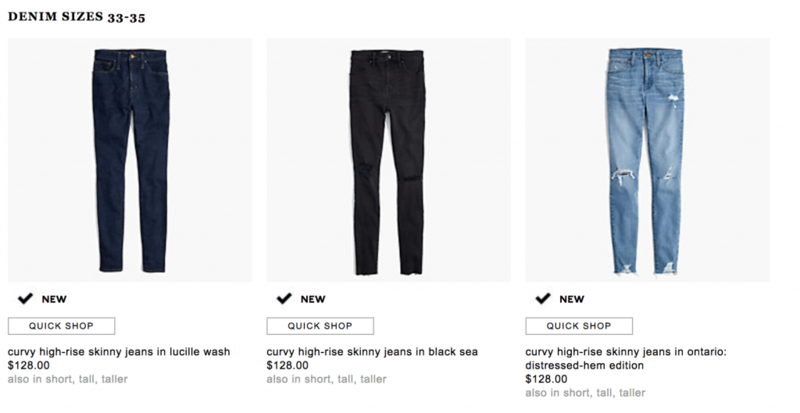 J Crew & Madewell Has Extended Sizes in their Jeans!?! The conversation around offering a wide range of sizes in fashion lines is a highly important one — especially considering the average size in the U.S. Supply and demand is a real thing and when one of the aspects is off balance, it’s a hot mess. Jeans are a classic fashion staple. Ever since women stepped their legs into a pair of denim pants back in the 1920s and 30s, jeans have been ingrained in our everyday wardrobe. And boyyy do we know the value of a good pair of jeans. Raise your hand if you’re still mourning that pair of jeans you wore holes into in between your lovely thick thighs and you can’t find another pair that fits just right like them. Today, the spotlight is on J.Crew and its sister company Madewell, who previously only offered the maximum denim size of 32, which equates to a U.S. size of 14. The two companies recently announced they are extending their denim line to reach a size 35. The styles range from “skinny” to “toothpick” on both brands’ sites. The cut of the jeans are tweaked to give a bit more room in the high hip, low hip, and top of thighs with a contoured waist, such as in the case of Madewell’s Curvy High-Rise Skinny Jean, available in three washes (Ontario, Lucille, and Black Sea). Well, the proof isn’t exactly in the pudding as the extension only went up a couple of sizes, which looks to be… maybe a size 16? We were hoping for at least up to a size 20 to start? And there is obviously a high demand because the biggest size of 35 is already sold out (on backorder). Imagine the impact of extending the range even further! As always, I appreciate the effort in opening up the door toward inclusiveness, but change never happens when we become complacent. The baby steps are appreciated… now it’s time to take big leaps. We all deserve! I appreciate the effort but I’m an inbetweener 12/14/16 depending on brand. J crews 14’s were tight on me, so this new size *might* fit – but I’ve needed an 18 in some J Crew pants. So all to say: it’s an okay start but I hope the size range for all of j crew and Madewell clothes extend waaaaaay up in short order. All plus size women need access to the well made suits, work pants etc they’re known for. I want size inclusivity in ALL their items. I lust for their clothes but am a size 24 so that is just a dream. It’s so hard to find well-made, classic, tailored clothing in plus sizes.